Click on the link belowbto see the impact of the PE Sports Premium in our school this year. DFE Sports Funding is designed to help provide additional and sustainable improvements to the quality of Physical Education and Sport offered by this school and schools in general. 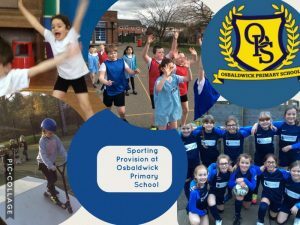 In 2016/17 Osbaldwick Primary School received £9,462 in sports funding. This is still to be assessed. In 2015/16 Osbaldwick Primary School received £9,346 in sports funding. A greater number of pupils who do not normally choose to access sporting activities are doing so in a non-competitive atmosphere. Resources are targeted to support a wider range of sporting PE activities including cycling. The PE Funding is designed to improve the educational and sporting experiences and outcomes of children and young people.